Qandilite: Mineral information, data and localities. 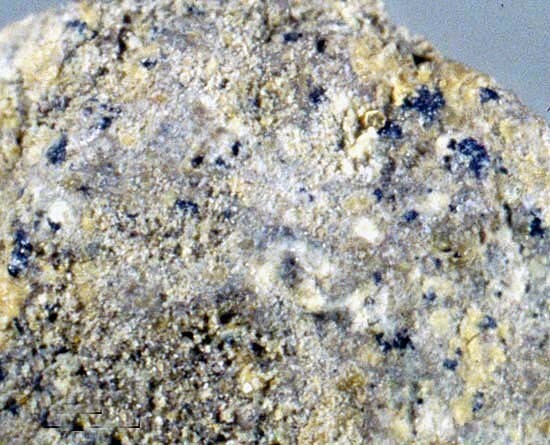 Named after the metamorphic Qandil Group of rocks, including the discovery locality. This page provides mineralogical data about Qandilite. Strathclyde University, the Royal Scottish Museum, Edinburgh, Scotland. Ecole Nationale Superieure de Mines, Paris, France. Musee de Mineralogie, Paris, France. Al-Hermezi, H.M. (1985) Qandilite, a new spinel end-member, Mg2TiO4, from the Qala-Dizeh region, NE Iraq. Mineralogical Magazine: 49: 739-744. Soluble in hot HCl, but only partially soluble in cold HCl, hot H2S04, and hot HN03. Jambor, J.L., Bladh, K.W., Ercit, T.S., Grice, J.D., Grew, E.S. (1988) New mineral names. American Mineralogist: 73: 927-935. Wechsler, B.A., Von Dreele, R.B. (1989) Structure refinement of Mg2TiO4, MgTiO3 and MgTi2O5 by time-of-flight neutron powder diffraction. Acta Crystallographica: B45: 542-549. Bosi, F., Hålenius, U., Skogby, H. (2014) Crystal chemistry of the ulvöspinel-qandilite series. American Mineralogist: 99: 847-851. Kaur, G., Mitchell, R. H., & Ahmed, S. (2016). Typomorphic mineralogy of the Vattikod lamproites from Mesoproterozoic Ramadugu Lamproite Field, Nalgonda District, Telangana, India: A plausible manifestation of subduction-related alkaline magmatism in the Eastern Ghats Mobile Belt?. Mondillo N., Balassone G., Boni M., Rollinson G. (2011): Karst bauxites in the Campania Apennines (southern Italy): a new approach. Per. Mineral., 80, 3, 407-432. Pascal, M.-L., Di Muro, A., Boudouma, O., Fointeilles, M., Principe, C. (2008): Zirconlite, calzirtite, baddeleyite, betafite, geikielite and qandilite in skarn ejecta from Vesuvius - inferences for the magma-wallrock interactions. EGU General Assembly 2008. Geophysical Research Abstract, 10, EGU2008-A-06674, 2008. ; Pascal, M.-L., Di Muro, A., Boudouma, O., Fointeilles, M., Principe, C. (2008): Zirconolite, calzirtite, baddeleyite, betafite, geikielite and qandilite in skarn ejecta from Vesuvius - inferences for the magma-wallrock interactions. EGU General Assembly 2008. Geophysical Research Abstract, 10, EGU2008-A-06674, 2008. ; Pascal, M. L., Fonteilles, M., Boudouma, O., & Principe, C. (2011). Qandilite from Vesuvius skarn ejecta: Conditions of formation and miscibility gap in the ternary spinel–qandilite–magnesioferrite. The Canadian Mineralogist, 49(2), 459-485.
ⓘ Nkpuma – Akpatakpa clay ? Ituma, C. G., Etukudoh, A. B., Abuh, M. A., Akpomie, K. G., & Obioha, C. I. (2018). Utilization of Nkpuma-Akpatakpa clay in ceramics: characterization and microstructural studies. Journal of Applied Sciences and Environmental Management, 22(1), 47-53. Golubkova, A. B., Nosova, A. A., & Larionova, Y. O. (2013). Mg-ilmenite megacrysts from the Arkhangelsk kimberlites, Russia: genesis and interaction with kimberlite melt and postkimberlite fluid. Geochemistry International, 51(5), 353-381. Wu, F. Y., Yang, Y. H., Mitchell, R. H., Li, Q. L., Yang, J. H., & Zhang, Y. B. (2010). In situ U–Pb age determination and Nd isotopic analysis of perovskites from kimberlites in southern Africa and Somerset Island, Canada. Lithos, 115(1-4), 205-222. Ferry, J.M. (1996) Three novel isograds in metamorphosed siliceous dolomites from the Ballachulish aureole, Scotland. American Mineralogist, 81(3-4), 485-496.